The thermal conductivity of seawater is 0.6 W/mK at 25 °C and a salinity of 35 g/kg. 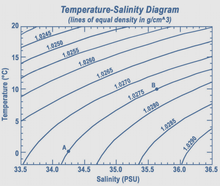 The thermal conductivity decreases with increasing salinity and increases with increasing temperature. Although the vast majority of seawater has a salinity of between 3.1% and 3.8%, seawater is not uniformly saline throughout the world. Where mixing occurs with fresh water runoff from river mouths or near melting glaciers, seawater can be substantially less saline. The most saline open sea is the Red Sea, where high rates of evaporation, low precipitation and river inflow, and confined circulation result in unusually salty water. The salinity in isolated bodies of water (for example, the Dead Sea) can be considerably greater still. 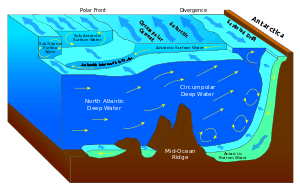 The density of surface seawater ranges from about 1020 to 1029 kg/m3, depending on the temperature and salinity. Deep in the ocean, under high pressure, seawater can reach a density of 1050 kg/m3 or higher. Seawater pH is limited to the range 7.5 to 8.4. The speed of sound in seawater is about 1,500 m/s, and varies with water temperature, salinity, and pressure. Seawater contains more dissolved ions than all types of freshwater. However, the ratios of solutes differ dramatically. 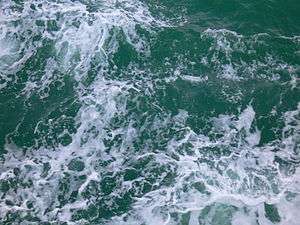 For instance, although seawater contains about 2.8 times more bicarbonate than river water based on molarity, the percentage of bicarbonate in seawater as a ratio of all dissolved ions is far lower than in river water. Bicarbonate ions also constitute 48% of river water solutes but only 0.14% of all seawater ions. 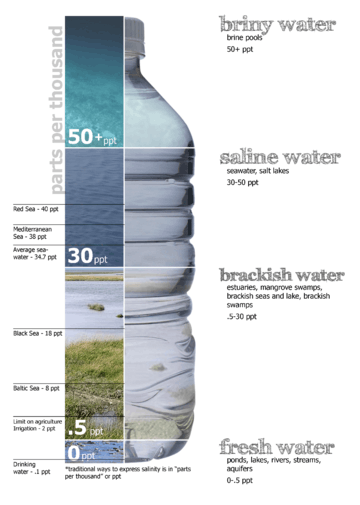 Differences like these are due to the varying residence times of seawater solutes; sodium and chlorine have very long residence times, while calcium (vital for carbonate formation) tends to precipitate much more quickly. The most abundant dissolved ions in seawater are sodium, chloride, magnesium, sulfate and calcium. Its osmolarity is about 1000 mOsm/l. Small amounts of other substances are found including amino acids at concentrations up to 2 micrograms of Nitrogen atoms per liter, which are thought to have played a key role in the origin of life. Research in 1957 by the Scripps Institution of Oceanography sampled water in both pelagic and neritic locations in the Pacific Ocean. Direct microscopic counts and cultures were used, the direct counts in some cases showing up to 10 000 times that obtained from cultures. These differences were attributed to the occurrence of bacteria in aggregates, selective effects of the culture media, and the presence of inactive cells. A marked reduction in bacterial culture numbers was noted below the thermocline, but not by direct microscopic observation. Large numbers of spirilli-like forms were seen by microscope but not under cultivation. The disparity in numbers obtained by the two methods is well known in this and other fields. In the 1990s, improved techniques of detection and identification of microbes by probing just small snippets of DNA, enabled researchers taking part in the Census of Marine Life to identify thousands of previously unknown microbes usually present only in small numbers. This revealed a far greater diversity than previously suspected, so that a litre of seawater may hold more than 20,000 species. Dr. Mitchell Sogin from the Marine Biological Laboratory feels that "the number of different kinds of bacteria in the oceans could eclipse five to 10 million." Bacteria are found at all depths in the water column, as well as in the sediments, some being aerobic, others anaerobic. Most are free-swimming, but some exist as symbionts within other organisms – examples of these being bioluminescent bacteria. Cyanobacteria played an important role in the evolution of ocean processes, enabling the development of stromatolites and oxygen in the atmosphere. Some bacteria interact with diatoms, and form a critical link in the cycling of silicon in the ocean. One anaerobic species, Thiomargarita namibiensis, plays an important part in the breakdown of hydrogen sulphide eruptions from diatomaceous sediments off the Namibian coast, and generated by high rates of phytoplankton growth in the Benguela Current upwelling zone, eventually falling to the seafloor. Bacteria-like Archaea surprised marine microbiologists by their survival and thriving in extreme environments, such as the hydrothermal vents on the ocean floor. Alkalotolerant marine bacteria such as Pseudomonas and Vibrio spp. survive in a pH range of 7.3 to 10.6, while some species will grow only at pH 10 to 10.6. Archaea also exist in pelagic waters and may constitute as much as half the ocean's biomass, clearly playing an important part in oceanic processes. In 2000 sediments from the ocean floor revealed a species of Archaea that breaks down methane, an important greenhouse gas and a major contributor to atmospheric warming. Some bacteria break down the rocks of the sea floor, influencing seawater chemistry. Oil spills, and runoff containing human sewage and chemical pollutants have a marked effect on microbial life in the vicinity, as well as harbouring pathogens and toxins affecting all forms of marine life. The protist dinoflagellates may at certain times undergo population explosions called blooms or red tides, often after human-caused pollution. The process may produce metabolites known as biotoxins, which move along the ocean food chain, tainting higher-order animal consumers. Pandoravirus salinus, a species of very large virus, with a genome much larger than that of any other virus species, was discovered in 2013. Like the other very large viruses Mimivirus and Megavirus, Pandoravirus infects amoebas, but its genome, containing 1.9 to 2.5 megabases of DNA, is twice as large as that of Megavirus, and it differs greatly from the other large viruses in appearance and in genome structure. In 2013 researchers from Aberdeen University announced that they were starting a hunt for undiscovered chemicals in organisms that have evolved in deep sea trenches, hoping to find "the next generation" of antibiotics, anticipating an "antibiotic apocalypse" with a dearth of new infection-fighting drugs. The EU-funded research will start in the Atacama Trench and then move on to search trenches off New Zealand and Antarctica. The ocean has a long history of human waste disposal on the assumption that its vast size makes it capable of absorbing and diluting all noxious material. While this may be true on a small scale, the large amounts of sewage routinely dumped has damaged many coastal ecosystems, and rendered them life-threatening. Pathogenic viruses and bacteria occur in such waters, such as Escherichia coli, Vibrio cholerae the cause of cholera, hepatitis A, hepatitis E and polio, along with protozoans causing giardiasis and cryptosporidiosis. These pathogens are routinely present in the ballast water of large vessels, and are widely spread when the ballast is discharged. 1.1%, Other 0.7%. Note that the diagram is only correct when in units of wt/wt, not wt/vol or vol/vol. Scientific theories behind the origins of sea salt started with Sir Edmond Halley in 1715, who proposed that salt and other minerals were carried into the sea by rivers after rainfall washed it out of the ground. Upon reaching the ocean, these salts concentrated as more salt arrived over time (see Hydrologic cycle.) Halley noted that most lakes that don't have ocean outlets (such as the Dead Sea and the Caspian Sea, see endorheic basin), have high salt content. Halley termed this process "continental weathering". Halley's theory was partly correct. In addition, sodium leached out of the ocean floor when the ocean formed. The presence of salt's other dominant ion, chloride, results from outgassing of chloride (as hydrochloric acid) with other gases from Earth's interior via volcanos and hydrothermal vents. The sodium and chloride ions subsequently became the most abundant constituents of sea salt. Climate change, rising atmospheric carbon dioxide, excess nutrients, and pollution in many forms are altering global oceanic geochemistry. Rates of change for some aspects greatly exceed those in the historical and recent geological record. Major trends include an increasing acidity, reduced subsurface oxygen in both near-shore and pelagic waters, rising coastal nitrogen levels, and widespread increases in mercury and persistent organic pollutants. Most of these perturbations are tied either directly or indirectly to human fossil fuel combustion, fertilizer, and industrial activity. Concentrations are projected to grow in coming decades, with negative impacts on ocean biota and other marine resources. Accidentally consuming small quantities of clean seawater is not harmful, especially if the seawater is taken along with a larger quantity of fresh water. However, drinking seawater to maintain hydration is counterproductive; more water must be excreted to eliminate the salt (via urine) than the amount of water obtained from the seawater itself. The renal system actively regulates sodium chloride in the blood within a very narrow range around 9 g/L (0.9% by weight). In most open waters concentrations vary somewhat around typical values of about 3.5%, far higher than the body can tolerate and most beyond what the kidney can process. A point frequently overlooked , in claims that the kidney can excrete NaCl in Baltic concentrations (2%), is that the gut cannot absorb water at such concentrations, so that there is no benefit in drinking such water. Drinking seawater temporarily increases blood's NaCl concentration. This signals the kidney to excrete sodium, but seawater's sodium concentration is above the kidney's maximum concentrating ability. Eventually the blood's sodium concentration rises to toxic levels, removing water from cells and interfering with nerve conduction, ultimately producing fatal seizure and cardiac arrhythmia. Survival manuals consistently advise against drinking seawater. A summary of 163 life raft voyages estimated the risk of death at 39% for those who drank seawater, compared to 3% for those who did not. The effect of seawater intake on rats confirmed the negative effects of drinking seawater when dehydrated. Although humans cannot survive on seawater, some people claim that up to two cups a day, mixed with fresh water in a 2:3 ratio, produces no ill effect. The French physician Alain Bombard survived an ocean crossing in a small Zodiak rubber boat using mainly raw fish meat, which contains about 40 percent water (like most living tissues), as well as small amounts of seawater and other provisions harvested from the ocean. His findings were challenged, but an alternative explanation was not given. In his 1948 book, Kon-Tiki, Thor Heyerdahl reported drinking seawater mixed with fresh in a 2:3 ratio during the 1947 expedition. A few years later, another adventurer, William Willis, claimed to have drunk two cups of seawater and one cup of fresh per day for 70 days without ill effect when he lost part of his water supply. During the 18th Century, Richard Russell advocated the practice's medical use in the UK, and René Quinton expanded the advocation of the practice other countries, notably France, in the 20th century. Currently, the practice is widely used in Nicaragua and other countries, supposedly taking advantage of the latest medical discoveries. Most ocean-going vessels desalinate potable water from seawater using processes such as vacuum distillation or multi-stage flash distillation in an evaporator, or more recently by reverse osmosis. These energy-intensive processes were not usually available during the Age of Sail. Larger sailing warships with large crews, such as Nelson's HMS Victory, were fitted with distilling apparati in their galleys. Animals such as fish, whales, sea turtles, and seabirds, such as penguins and albatrosses, can adapt to a high saline habitat. For example, the kidney of the desert rat can concentrate sodium far more efficiently than the human kidney. ASTM International has an international standard for artificial seawater: ASTM D1141-98 (Original Standard ASTM D1141-52). It is used in many research testing labs as a reproducible solution for seawater such as tests on corrosion, oil contamination, and detergency evaluation. ↑ "U.S. Office of Naval Research Ocean, Water: Temperature". ↑ Sylte, Gudrun Urd (24 May 2010). "Den aller kaldaste havstraumen". forskning.no (in Norwegian). Retrieved 24 May 2010. ↑ Chester, Jickells, Roy, Tim (2012). Marine Geochemistry. Blackwell Publishing. ISBN 978-1-118-34907-6. ↑ Stumm, W, Morgan, J. J. (1981) Aquatic Chemistry, An Introduction Emphasizing Chemical Equilibria in Natural Waters. John Wiley & Sons. pp. 414–416. ISBN 0471048313. ↑ "Desalination and Water Treatment" (PDF). Department of Mechanical Engineering, Massachusetts Institute of Technology. April 2010. Retrieved 17 October 2010. ↑ "Thermal conductivity of seawater and its concentrates". Retrieved 17 October 2010. ↑ "World Ocean Atlas 2009". NOAA. Retrieved 5 December 2012. 1 2 Gale, Thomson. "Ocean Chemical Processes". Retrieved 2 December 2006. 1 2 3 Pinet, Paul R. (1996). Invitation to Oceanography. St. Paul: West Publishing Company. pp. 126, 134–135. ISBN 978-0-314-06339-7. ↑ Hogan, C. Michael (2010). "Calcium", eds. A. Jorgensen, C. Cleveland. Encyclopedia of Earth. National Council for Science and the Environment. ↑ "Osmolarity of sea water". ↑ Tada, K.; Tada, M.; Maita, Y. (1998). "Dissolved free amino acids in coastal seawater using a modified fluorometric method" (PDF). Journal of Oceanography. 54 (4): 313. doi:10.1007/BF02742615. ↑ Jannasch, Holger W.; Jones, Galen E. "Bacterial Populations in Sea Water as Determined by Different Methods of Enumeration" (PDF). Limnology and Oceanography. Association for the Sciences of Limnology and Oceanography. 4 (2): 128–139. doi:10.4319/lo.1959.4.2.0128. Retrieved 13 May 2013. ↑ "Ocean Microbe Census Discovers Diverse World of Rare Bacteria". ScienceDaily. 2 September 2006. Retrieved 13 May 2013. ↑ Maeda, M.; Taga, N. (31 March 1980). "Alkalotolerant and Alkalophilic Bacteria in Seawater" (PDF). Marine Ecology – Progress Series. 2: 105–108. doi:10.3354/meps002105. Retrieved 13 May 2013. ↑ Cheung, Louisa (31 July 2006). "Thousands of microbes in one gulp". BBC News. Retrieved 13 May 2013. ↑ Leslie, Mitchell (5 October 2000). "The Case of the Missing Methane". ScienceNOW. American Association for the Advancement of Science. Retrieved 13 May 2013. ↑ "Antibiotics search to focus on sea bed". BBC News. 14 February 2013. Retrieved 13 May 2013. ↑ "Radioactivity in the marine environment". National Academies, 1971 page 36. ↑ Hoyle, Brian D.; Robinson, Richard. "Microbes in the Ocean". Water Encyclopedia. ↑ Doney, Scott C. (18 June 2010). "The Growing Human Footprint on Coastal and Open-Ocean Biogeochemistry". Science. 328 (5985): 1512–1516. doi:10.1126/science.1185198. Retrieved 16 December 2011. ↑ "Can humans drink seawater?". National Ocean Service (NOAA). ↑ "29". Shipboard Medicine (PDF). Retrieved 17 October 2010. ↑ Etzion, Z.; Yagil, R. (1987). "Metabolic effects in rats drinking increasing concentrations of seawater.". Comp Biochem Physiol A. 86 (1): 49–55. doi:10.1016/0300-9629(87)90275-1. PMID 2881655. ↑ Heyerdahl, Thor; Lyon, F.H. (translator) (1950). Kon-Tiki: Across the Pacific by Raft. Rand McNally & Company, Chicago, Ill.
↑ King, Dean (2004). Skeletons on the Zahara: a true story of survival. New York: Back Bay Books. p. 74. ISBN 978-0-316-15935-7. ↑ Rippon, P.M., Commander, RN (1998). The evolution of engineering in the Royal Navy. Vol 1: 1827–1939. Spellmount. pp. 78–79. ISBN 0-946771-55-3. ↑ "ASTM D1141-98(2013)". ASTM. Retrieved 17 August 2013. Vanadium concentration in seawater and estuary environments is around 1.5–3.3 ug/kg .